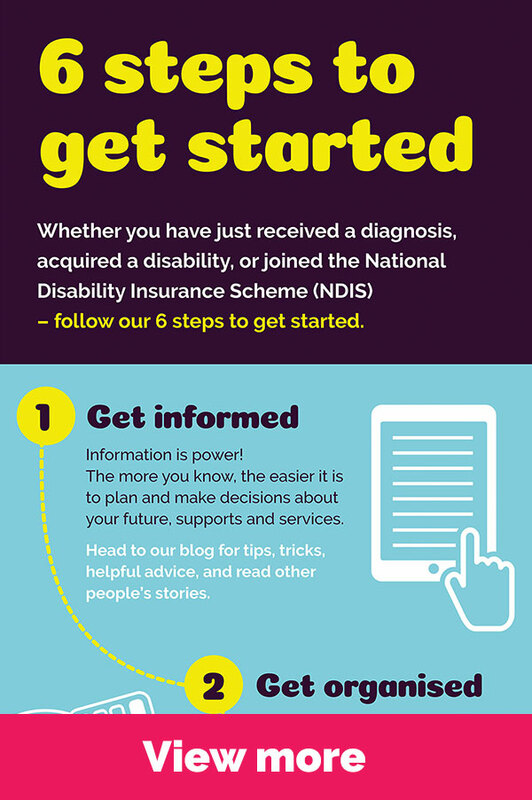 Whether you have just received a diagnosis, acquired a disability, or joined the National Disability Insurance Scheme (NDIS) – follow our 6 steps to get started. If you don’t know where to begin, you’re concerned about your child’s development or behaviour, or you’re just feeling overwhelmed, contact us for free advice or an assessment on 1300 NOVITA – we’re always here if you need us. You can also follow us on Facebook to get the latest news and connect with other parents and carers. something specific, like communication, daily routines or toilet training. If you’re just after some tips, tricks and helpful advice, or want to read other people’s stories, then head to our blog. Here are some other good sources of information about disability and services that may be useful. If you have lots of appointments with different doctors or specialists, start a notebook to record all your conversations and appointment dates. Make sure you keep a copy of your receipts, invoices, forms and documentation in case you need them down the track. When it comes to the NDIS, getting organised can be confusing. We’ve been working with the Scheme since 2013, so call us if you need a hand at any stage throughout the process. Every child and family is unique. We can help you identify services that will meet your child’s individual needs (even if we don’t offer them ourselves) and the best funding options for you. State Government funded – prior to January 1 2017 young people aged 15-17, living with physical disability, may be eligible for State Government funding. Self-funded – you can pay the full fee without any funding. It’s important to start early childhood intervention as soon as possible, to give your child the best possible outcomes. It’s never too early (or too late!). Babies can start early intervention therapies from three months old and intervention continues to be beneficial from thereon in. Once you have an approved NDIS plan, it will be up to you to decide where to spend your money and which provider you want to use. If you choose to work with Novita, we will support you to make a plan that includes all the services, strategies and supports your child needs, based on the goals identified in their NDIS Plan. Visit the I’ve got a Plan page on our website for a full list of benefits and more information. Make sure they use evidence-based practices. Once you start your services, it’s only a matter of time before you’ll start celebrating your child’s achievements – big and small. Many parents come to us having been told their child won’t or can’t achieve. But we have more than 75 years of experience, and we know the best outcomes are achieved when we focus on kids’ abilities and strengths, and celebrate the amazing and extraordinary things they do every day! View the "6 Steps Infographic"